Just before Christmas I posted about the massive Lush giftbox that I won. I was a Lush virgin but had heard so many good things about the brand, especially their bath bombs and bubble bars. 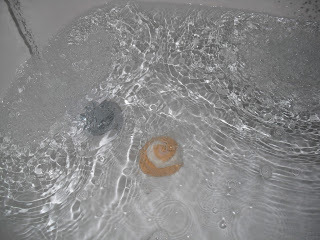 So here is my short review of the 3 Gold Rings Bubble Bar and the Lil Lush Pud Bath Bomb. First off I tried the Lil Lush Pud bath bomb looking forward to a Christmassy smelling fresh clean bath. I like the way it looks, and it smelt quite nice too. But I think it looks better than its use. 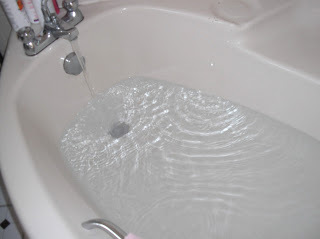 My nice clean bath water. 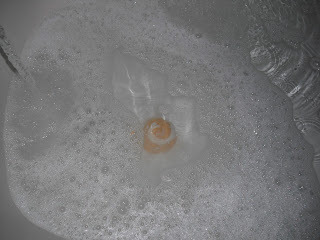 In it goes into my bath! Quite exciting… although a bit of a minging colour. I’m sorry but this just looks completely grim and disgusting. 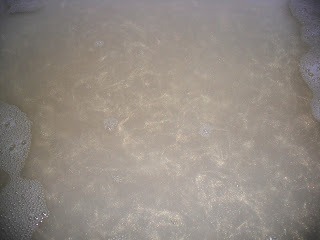 Who would get in a bath tub full of brown water?! I really didn’t like it and found it really off putting. I want to get clean in the bath, not dirty. 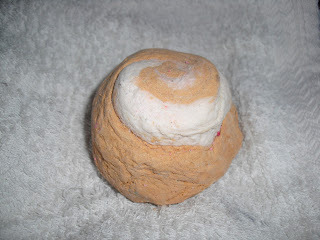 Lush say it contains lemon peel powder, clove powder, aloe vera extract and rose absolute, and that it smells of marzipan. The only good thing about this bath bomb is that it left my skin feeling nice and soft and moisturised, which I wasn’t expecting a bath bomb to do. This bubble bar had a slight resemblance to a turd, but it wasn’t too off putting. It had swirls of gold and white and it smelt pretty good too. Good start. 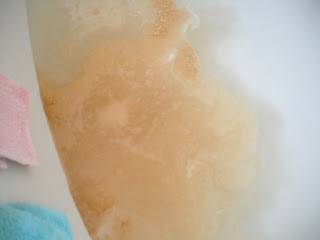 In it goes into my bath.. my first bubble bar experience I wasn’t sure what to expect. It soon got going and bubbles started appearing! Yipee! 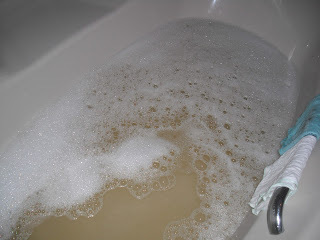 Again, as with the Lil Lush Pud, it produced a rather murky looking bath water colour. But it was actually more golden than brown this time! It was hard to take a photo of, but here is the bath water with lots of sparkly gold bits in 🙂 I like it! It didn’t actually leave my skin shimmery unfortunately, but it did leave a gold fairy dust at the bottom of my bath tub. Nice. Overall I don’t understand what the big deal about Lush is. Who wants murky brown bath water and pays £2 for the privilege? Not me! I still have a bunch of other Lush products to try out, and I’m really hoping I fall in love with them! Maybe these two aren’t popular favourites. What do you think of Lush? Do you like it? Overpriced? You need to brush up on the products before you use them. 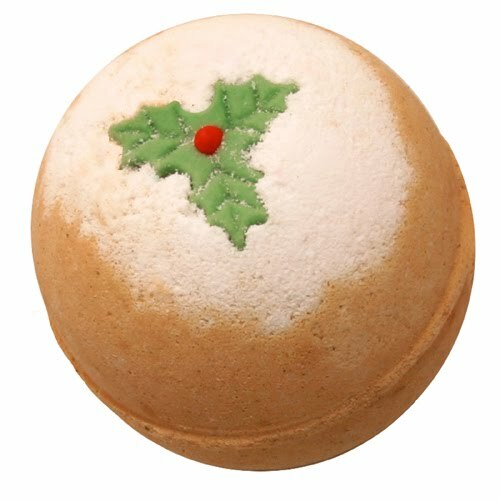 You did the bubble bar all wrong – if you won a gift set an insert should have been included that tells about each product and how to use it, if you didn't get that, a little research online or look at the lush site. Whoopsy.. soz 😉 I still liked it anyway, and it still worked. Yipee. And by the way, I dont know why you post anonymously, as I know where you are from and that you are actually a fan of my blog. Jealous/mean? @Anonymous you think you're so clever posting anonymously just because you use that name? Hilarious. Doesn't take a couple of minutes on a statcounter to find where you are based and that you also happen to 'Like' Victoria's Vintage facebook page… Following that we only have to search for the 'liker' based in Minneapolis and we know who you are. Moron. 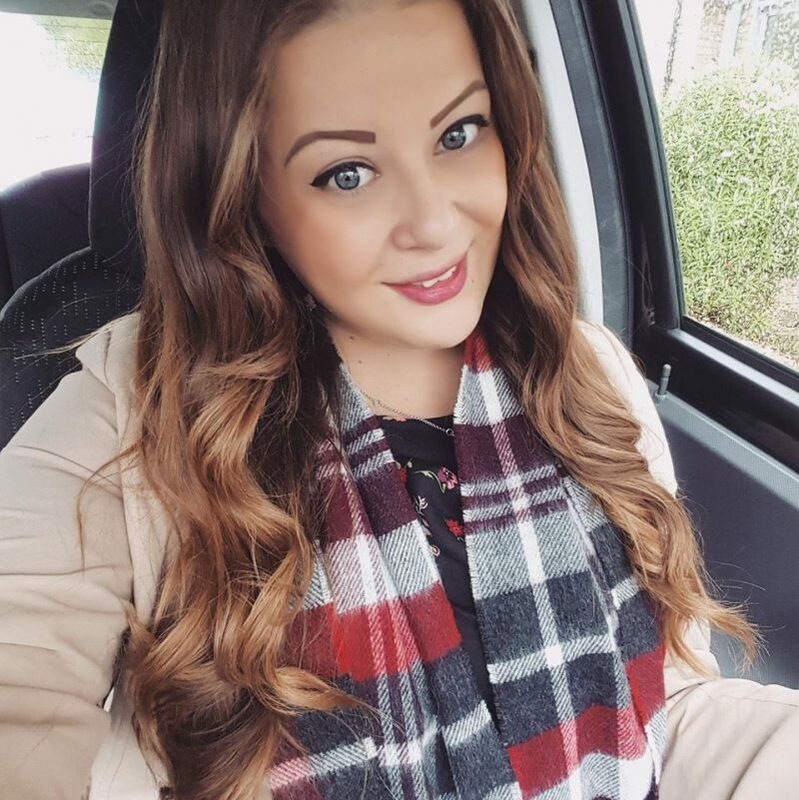 Not to mention, Vikki wasn't even slating the product so I hardly understand why you're telling her off for using it 'all wrong'… Looks in the pictures like it created bubbles nonetheless, so what seems to be the problem here, you troll. Get a life or get a hobby. Sad act. Could not agree with this comment! If you have nothing nice to say, then don't say anything at all!.. It's pathetic how they remain anonymous!! – Also gabriellasofia.. how the heck did you manage to find all that out? haha you clever clever lady.. honestly i would of never of thought to do that.. Mind you i've set my blog so that anonymous people like above can't write nasty comments haha! Also i agree, Vikki wasn't even slating it the product also i use the bubble bar like that sometime and it still creates bubbles.. i don't think there is a wrong or right way to use a bubble bar, she can use it however she bloody well likes! ** Sorry – it's meant to say 'Could not agree with this comment more'! I post Ana cuz I don't have any of the other accounts to log in with. Yes I followed the Facebook link from the lush wall. Sorry you read tone in my comment, none was intended. No I'm not a follower and haven't/don't like your page. I was new here and after such a warm welcome not sure how long I'll stay. I've already replyed but apparently the comments were taken down or need approval or whatever. No you supersluths do t know who I am – you know I followed a link, big deal. Do you all bully school kids for fun too or am I just lucky? Again I didn't mean any disrespect or really anything, I was just letting you know. And since I cant log in. My name is Liz and if you don't want people to post Ana. dont have it as an option. Ananymous posting is no longer available. Not had a problem before. Further comments were deleted as it was just silly. 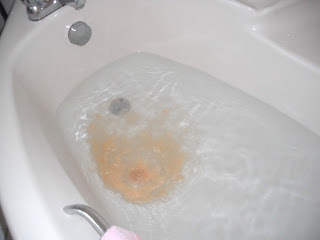 A tip regarding the bubble bar: you aren't supposed to throw it into your bath whole like a ballistic, you are supposed to crumble it up prior to putting under the stream of running water. This way, many more bubbles will be created. 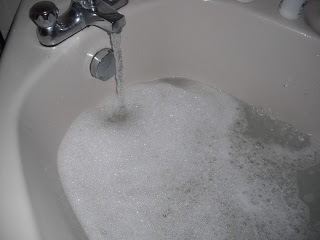 I suggest finely dicing it into a powder-like consistency and then dropping it under the running water for maximum bubbles!